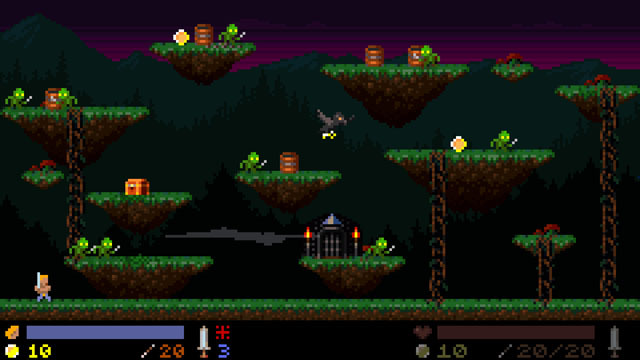 Thy Sword, from Game Phase, is a chunky lo-fi action adventure platformer set in a fantasy world. The player selects a sword-wielding warrior to take on the quest and can eventually unlock additional playable characters as well. Player combat foes with sword strikes, bows and arrows, and magic, and can meet up with NPC's to purchase new items, weapon upgrades, and health restoratives. Players can go it alone or team up with a friend for local 2P co-op or enter into player vs. player combat. Levels are procedurally generated and take place over a number of traditional fantasy locales including forests, mountains, and caves, which are selectable from a world map. The game is now available on PC via Steam.